What did you think of Identifying the Nature of the Noun in a Sentence ? A possessive noun shows who or what owns something or has something. When a noun is singular, add an apostrophe and -s ('s) to form the singular possessive noun. 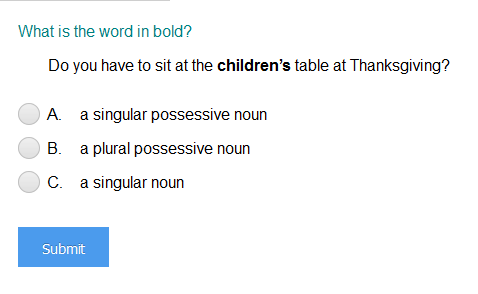 When a noun is plural and ends in -s, just add an apostrophe (') to form the plural possessive noun. When a noun is plural and does not end in -s, add an apostrophe and -s ('s) to form the plural possessive noun.